I had a medical student working with me this week and delivered a mini-lecture on healthcare funding in the United States and why some practices don’t take Medicaid or opt out of Medicare. It was an eye opener to a student in his third year, which tells me that healthcare finance isn’t part of his medical school’s curriculum. He was surprised to learn that compared to the cost of delivering care in our metropolitan area, that Medicare typically pays 80 cents on the dollar but Medicaid only pays 24 cents on the dollar. Something tells me that after our conversation, his primary care fire is not burning bright. We spent some time talking about concierge medicine and direct primary care, and he found this piece about concierge emergency services. Apparently, patients on New York’s Upper East Side can afford to pay upwards of $5,000 annually for access to a private emergency practice plus per-visit fees. According to the article, the facility keeps two physicians and a physician assistant ready to see patients at all times, but only see a handful of patients each day. I couldn’t help but try to calculate their expense model in my head while he was telling me about the piece, and as I saw my 16th patient in three hours, I began to wonder if they are hiring. We also discussed this American Academy of Family Physicians “In the Trenches” blog post addressing the need for competition and innovation in the EHR market. It brings up some good tidbits that I had forgotten. First, let’s take a look back to 2004. President George W. Bush included computerized health records in his State of the Union Address, and in April of that year launched a campaign to promote healthcare transformation. The initiative projected that “within the next 10 years, electronic health records will ensure that complete healthcare information is available for most Americans at the time and place of care, no matter where it originates.” That decade has come and gone, and for most of us, health records are held in a patchwork of systems that don’t talk to each other. Martin hits the nail on the head with his summary of the AAFP efforts to improve innovation: “Eliminate or reduce administrative requirements placed on health IT products – the poor usability of EHRs is often due to external requirements established by regulators and payers, such as clinical documentation, which do not add clinical value.” I remember the copy of the physician note that my father brought back from a trip to Australia, when he had a wicked case of sinusitis. Basically, it documented a brief history, described the physical exam as it related to sinus findings, then proceeded to a diagnosis and an antibiotic recommendation. There was no capturing bullet points to substantiate billing requirements or other such nonsense. The detail told me exactly what was going on with the patient and didn’t drive me to distraction. Sure, it didn’t include an assessment of my father’s chronic conditions, his nutritional status, whether he is a fall risk, or a number of other data points, but I envy the physician who was able to focus on the problem at hand and still get paid, even in the outback. I look forward to the day when we have systems that are better at highlighting important data while allowing less-critical data points to fade to the background unless clinical decision support or other algorithms identify a need to bring that information to the front. I heard about the idea of “signing your scrub cap” several months ago, but hadn’t seen it in person until this week. I was attending a Grand Rounds lecture at my hospital, and several people walked in with their name and role written on their scrub caps. 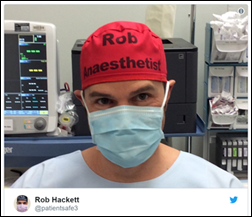 Of course, one always has to wonder why people wear their caps outside the surgery suite, but I appreciate the move towards clear identification of the care delivery team. Having been the nameless student responding to “you, more tension on the retractor” for several years, it might have added some humanity to medical school rotations. As a patient, there are so many people in and out when you’re having a procedure, it would be great to not have to guess who is who especially when you have mind-altering drugs dripping through your IV. I wrote about the All of Us Research Program some time ago, and its national launch is finally here. Beginning on May 6, adults 18 and older can join this project, which is part of the Precision Medicine Initiative. Billed as potentially the longest and most diverse longitudinal health research program ever developed, it needs more than a million individuals to provide data. Participants will share both patient-generated and EHR data, and may also be asked to provide biometric data along with blood and urine samples. The consent process takes up to 30 minutes to complete and can’t be interrupted, so if you decide to take part be sure you have a comfy chair to work from. 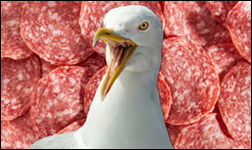 Not from Weird News Andy, but might as well be: A hotel guest recently allowed to stay at the Fairmont Empress in Victoria after being banned more than a decade ago due to some bad decisions involving pepperoni. As the story goes, the traveler had a “suitcase full of pepperoni” and left it near an open window so it would stay cool. While he was out of the room, seagulls discovered the suitcase, ate the pepperoni, and left a mess in the room. I’ve seen a raccoon open a tab-top soda can, but after reading the story I wasn’t exactly sure how a seagull opens a suitcase. Fortunately, NPR had some more thorough reporting and explained that the pepperoni was actually laid out on a table near the window.